I know what it’s like to get the “red devil” in the veins. You can learn about Adriamycin, a name brand chemotherapy, on WebMD. Or, if you prefer, you can check on doxorubicin, the generic term, using MedlinePlus, a comprehensive and relatively reliable public venture put forth by the National Library of Medicine and National Institutes of Health. 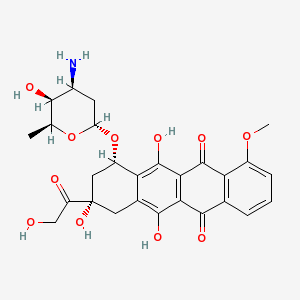 If you’re into organic chemistry, you might want to review the structure of 14-hydroxydaunomycin, an antibiotic and cancer therapy first described 40 years ago in the journal Biotechnology and Bioengineering. from the National Center for Biotechnology Information (NCBI) database, http://pubchem.ncbi.nlm.nih.gov, accessed 12/11/09. When I was a medical student, I studied some facts about doxorubicin hydrochloride, enough at least to answer a few questions during pharmacology exams. Later, as a resident in internal medicine, I knew the drug to be an anthracycline, a chemotherapy that intercalates into DNA, wreaking havoc in cells’ genetic material and reducing the replication potential. As an oncology fellow, I prescribed and administered the clear, intense red fluid to patients with lymphoma and breast cancer. I learned to be careful: if the medicine slips from the intravenous catheter and enters the nearby, tender tissue below the skin, it can harm. The drug commonly causes hair loss and stomatitis; mouth sores can be so painful it hurts to eat, even when the nausea doesn’t squelch your hunger, or talk. Adriamycin affects the bone marrow, where blood cells are produced, and heart. It’s not an easy drug; my patients knew this and so did I. This month marks seven years since my first dose of Adriamycin, part of the “A/C” regimen that’s sometimes given to breast cancer patients. Was it worth going bald, getting anemia, sluggishness, mouth sores, chemo brain and all else that I experienced? Yes; I have no doubts. But I was lucky; my tumor was small and I needed only a few cycles. I never knew Adriamycin as the red devil until a few years ago when a friend’s stepmother, undergoing treatment, used the term in an email. She’s a woman who read lots of blogs and shared her experiences with other breast cancer patients on–line. I realized that despite working in an academic medical center and regularly communicating with physician-friends and oncologists at meetings, I still had a few things to learn. Now that I’m writing about cancer, I wonder what sorts of information people really want or need to make informed decisions. I suppose some would like to know the chemical structure of doxorubicin before receiving such a potentially poisonous, possibly life-saving drug. Maybe a patient’s husband, or daughter, would seek details about the half-life, metabolism in the liver, side effects and more. When I received my chemotherapy, I didn’t want to read about breast cancer or treatments. Rather, I chose an oncologist I trusted and liked. Then, for the most part, I followed her advice. But this sort of strategy’s not for everyone, particularly for patients who don’t know their doctors as I knew mine. Besides, most cancer patients aren’t already board-certified oncologists. Ultimately, you can’t know everything about Adriamycin until you’ve had it in your veins. Whether being familiar with the chemical structure makes a difference, is less certain. What’s clear is this: with so much information at our disposal, there’s an opportunity for patients to help doctors make better decisions. I am a lymphoedema nurse and have not had breast cancer – so haven’t had adriamycin. I feel that the term ‘red devil’ is horrible and should be eliminated from the vocabulary used for this chemotherapy. Thanks for writing in. You make a valid point, that the term is scary, and potentially discouraging to patients. I wrote on this, a while back, because it was something I didn’t “know” as an oncologist that some patients refer to it as such.